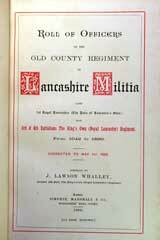 ‘History of the Old County Regiment of Lancashire Militia Late 1st Royal Lancashire (The Duke of Lancaster’s Own); Now 3rd and 4th Battalions The King’s Own (Royal Lancaster) Regiment. 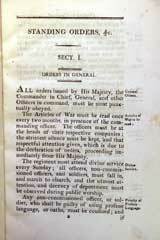 From 1689 to 1856 by the Late Major R J T Williamson. Continuation to 1888 by Colonel J Lawson Whalley. First Edition 1888. Published London by Simpkin, Marshall and Co. 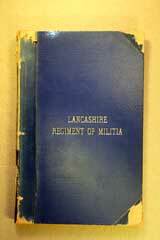 The Early History of the Lancashire Regiment of Militia (3rd and 4th Battalions) King’s Own Royal Lancaster Regiment, 1642-1799. By J Lawson Whalley, Late Lieutenant Colonel, Commandant. Published by E Phillips & Co, Printers, Standard Office, New Street, Lancaster, 1904. Roll of Officers of the Old County Regiment of Lancashire Militia (late 1st Royal Lancashire) The Duke of Lancaster’s Own, 1642-1889. 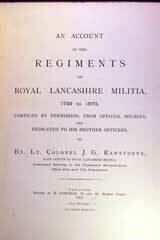 Now the 3rd and 4th Battalions, King’s Own Royal Lancaster Regiment. Corrected to May 1889. By Colonel J Lawson Whalley, published by Simpkin, Marshall and Co. London, 1889. An Epitomized History of the Militia (The “Constitutional Force”) Together with Origins, Periods of Embodied Service, and Special Services including South Africa, 1899-1902, of Militia Units existing 31st October 1905. By Colonel George Jackson Hay, CB, CMG, London. 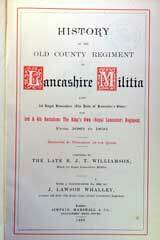 Trust Deed for the 3rd and 4th (Militia) Battalions, King’s Own Royal Lancaster Regiment, 29th Aug 1899. Sharp & Son Lancaster. 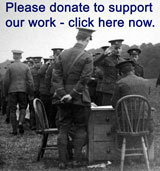 Eustace Arthur Maude, joined the 4th Militia Battalion on 18 Feb 1900 as a 2nd Lieutenant, he was embodied on joining. He remained serving with the Mounted Infantry in South Africa when the 4th Battalion returned home and received a regular commission on 8 Feb 1902. He transferred to the 26th Punajaubis in 1904. Captain 1909. Temporary Major with 10th Worcester Regiment and 13th Worcester Regiment 1915. Brigade Major 12 Dec 1917. Deputy Assistant Adjutant General, India, 2 Feb 1919. DSO. Photocopy of letter sent by Richard Fortune 1st Royal Lancashire Militia from Corfu to his parents, and typewritten transcript. 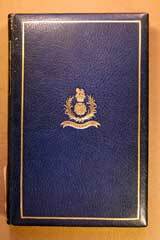 Insurance Policy Extension of Wording, 3rd Battalion King’s Own Silver, 1936. Royal Humane Society Certificate – Militia – Soldiers of the Regiment etc. Illuminated Certificate: Royal Humane Society: Private John Wolfe, of the 1st Royal Lancashire Militia, 1879 Regarding rescue St. George’s Quay, Lancaster. New Year Card from Colonel B N North and the 3rd Militia Battalion, King’s Own Royal Lancaster Regiment, South Africa 1901. Invitation from the Mayor of Lancaster to attend the Council Chamber in February 1900 to be present at the laying-up of the Colours of the 3rd Militia Battalion before they depart to South Africa. Invitation to Curator, King’s Own Museum Ticket to attend Restoration of the Colours of the 4th Militia Battalion 24th October 1928. Copy of letter written in November 1680 from Lord Derby re the Lancashire Militia. Letter from Chief Constable of Lancaster, dated 7th June 1897, to Colonel Whalley concerning the Royal Lancashire Militia. Letter to Major Trappes, 4th (Militia) Battalion, King’s Own Royal Lancaster Regiment, 20th July 1883. Accession Number: KO2590/301a & b. Letter and envelope re appointment of J Rowlandson 1886 to 3rd and 4th (Militia) Battalions, King’s Own Royal Lancaster Regiment. Accession Number KO1024/02 & 03. ‘Defence Against Foreign Invasion’ Notice for people to join the Militia force against French invasion. Torrington Corps of Volunteers - recruiting handbill dated 25th June 1797. Torrington is in North Devon and the connection with the Royal Lancashire Militia may be that the RLM was based in Plymouth between March 1797 and September 1798. 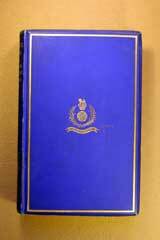 Confidential Inspection Report of the 3rd and 4th Battalions, King’s Own Royal Lancaster Regiment 1883. 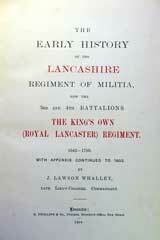 Confidential Inspection Report of the 3rd and 4th Battalions, King’s Own Royal Lancaster Regiment, 1882. Sale document: ‘Extremely Valuable Freehold Land and Buildings, The Property of the County Palatine of Lancaster to be sold by Auction by Mr G H Petty, on 21st June 1882,.... The Storehouse and Depot lately occupied by the 1st Royal Lancashire Militia in South Road Lancaster. 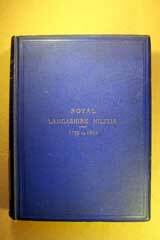 Programmes for the Laying Up of the Colours of the Royal Lancashire Militia, 18th September, 1932. Programme of Ceremony, Restoration of the Colours of the 4th Militia Battalion 24 Oct 1928. Programme for the Royal Review of the Home and Colonial Troops by Her Majesty the Queen, on Laffan’s Plain, (Aldershot) Tuesday 1st July 1897. The Parade included the 3rd Militia Battalion of the King’s Own Royal Lancaster Regiment. 3rd and 4th Militia Battalions, King’s Own Royal Lancaster Regiment, Receipt for Mess 20th July 1883. Receipt from Stationers Hall, 8th June 1889 for the book Roll of Officers of the 1st Royal Lancashire Militia. Warrant for Holding Courts Martial, 1796, Militia. Advice regarding Recruiting, Earl of Derby’s Regiment of Militia, 1703. Description of the Colours of the Royal Lancashire Militia. Militia Pay Document, May 1783.